Actually this is just the first update as there are additional ones coming. When doing the first version of Super Jumpy Ball I had zero budget so I couldn't afford to buy and art or fancy things so it was mostly my developer art that was used. I wanted to focus on level design and learn that well so I decided to go with minimalist graphics so I did the original game mostly in black and white. In the end I did 40 levels and the game was ok. So in the coming updates I want to implement better graphics and probably a story in the game as that is a frequent question I get from users. The goal is also to publish the game on Nintendo Switch. So what's new in this release? In this the v1.3.3 update I prepared support for tilemaps and also screen transitions (this is not yet playable). The jumping, wall jumping and how the character moves has been improved and I've added the possibility to play with your friends, couch style multiplayer with up to 8 players. The focus has been to nail as good input and player control as possible for the game to work in a platform levels with elements of puzzles. Another important aspect was to improve the leaderboard where each level had it's own leaderboard before. Now there is a leaderboard per game mode which makes it more fun and interesting. So what's the major update? Well the real major update is that the I'm back working on this game and additional builds will be shipped on a weekly basis. * New Feature: Added multiplayer support for survivor game mode. * Improved: Survivor, change so that we use prebuilt sections using Tile map editor. * Improved: Camera follows player on Survival game mode. If there are multiple players the game tries to keep as many as possible in view. * Improved: Added parallax background on Survivor level. * Improved: Added ability to enter players name on PC and Android. * Improved: Optimized controls (even more). * Improved: Added ability to do short or long jumps depending how long you hold down the jump button. * Fixed bug: Ball got snagged on corners at times. * Fixed Bug: If you press pause button while the level is ending the game freezes. * Fixed bug: On Android the device id was reset each time you closed the game, causing lots of new users to be created. * Fixed Bug: Skip level help label wrong color on Android. * New Feature: Added screen shakes when you die. * New Feature: Added vibration when you die. * Improved: Made controls more responsive. * Improved: Added ability hold down jump button, if you hit something you bounce on it, like a real bouncing ball. * Improved: Changed Hall of fame to be the total time you have spent on each level instead of a single leaderboard per level. 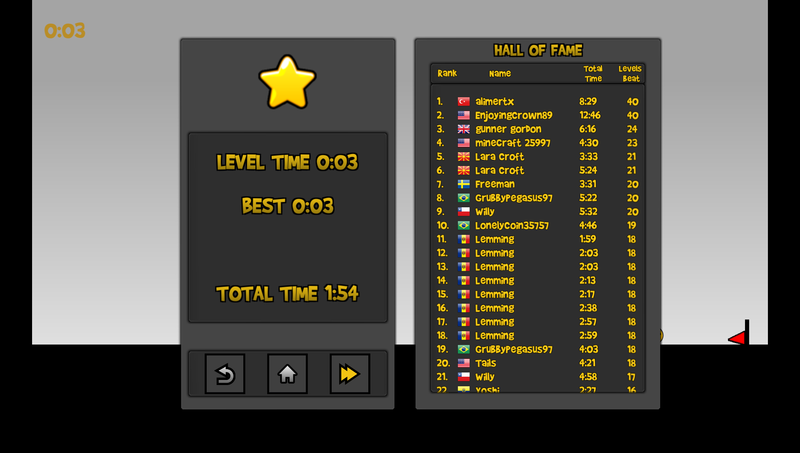 * Improved: Hall of fame is shown directly after you complete each level. * Improved: Allow player to push jump button when in mid air after rolling off an edge for a very short time. This makes the game more forgiving when trying to jump from edges. * Improved: You can go back to main menu when you complete a level. * Improved: New and improved UI graphics. * Fixed Bug: Face get stuck at surprised at times. * Fixed Bug: Hall of fame waits to download score until the players score has been properly submitted. * Game now runs on Nintendo Switch, yippee! Basketball mini-game and more fun in pvp mode v1.3.4 is out!